Horror Game includes a complete compliment of sound FX to describe any horror environment. The possessed, beings from the grave, terror and tension, chants and spells, sounds of magic, haunted clock, tick tock timer, chilling chimes, exorcism, full moon, zombie sounds, underworld, dark wind and ethereal voices. That’s just to name a few. Easily create vivid and unsettling soundscapes with more than 70 fear laden loops. For game makers, Horror Game SFX includes all the gameplay essentials for crafting an extraordinary horror sound experience. Even more, it’s organized by action category to speed your workflow. 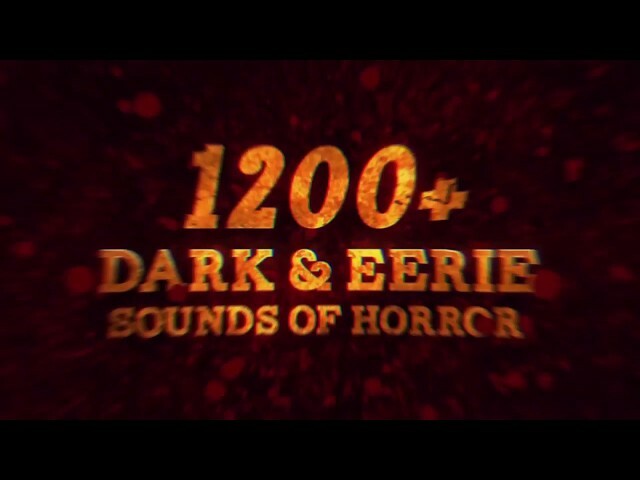 206 Designed and Source Creature Sound Sets like; Banshee Scream, Wail, Bloated Zombie, Demon, Ghost, Evil Clown, Beast, Zombie, Game Bats, Mice, Spirits, Wings & more – Both Dry and Wet Versions Available! 164 Ethereal Voices like Demonic Breaths, Exhales, Demonic Speaking in Tongues, Possessed Being and Haunted Whispers, The Naysayers, The Prophet, Shaman, Infected Soul – Both Dry and Wet Versions Available!